Are you planning on taking a vacation to the Rocky Mountains next summer? It sure sounds good! Some of the most beautiful scenery in the world is found in the Rocky Mountains. Have you ever been to Colorado Springs, Colorado? It is an awesome place. The first time we drove to Colorado Springs in 1999, we were absolutely amazed. There is so much to see. We have returned multiple times and still have not seen all the sites. One of the big reasons for not seeing everything is that we keep wanting to go back to the things we have seen and experience them again. There is Pikes Peak, Garden of the Gods, The Air Force Academy, Focus on the Family and many, many other things to see, do and enjoy. It really is one of the most beautiful places on earth. Plus an hour or so from Colorado Springs holds many more natural attractions. I also have another motive for enticing you to visit Colorado Springs. 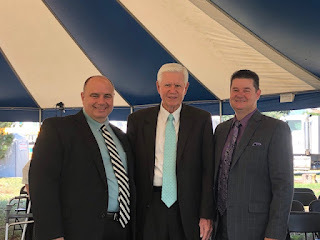 We are scheduled to preach another tent revival for Pastor Thomas and the Souls Harbor Church in Colorado Springs from June 16-21, Sunday-Friday. We had a wonderful time there in 2018. It would be awesome if you planned part of your summer vacation that week and visited tent revival a night or two. There are plenty of hotels in the city and you would be as welcome as the flowers in May. The church is at 1715 4th St, Colorado Springs, Colorado. Let us know if you think you might be able to be there. We would love to have you and I know you would enjoy the area.